Vintage - Royal Winton Grimwades China, Tea Service Pieces in the "Golden Age-Ribbed" Pattern. 4-Pieces plus 2-Lids, Circa 1950's. 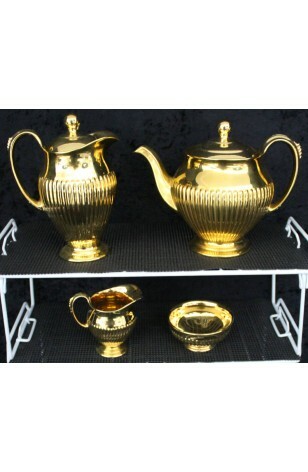 A beautiful Gold Lustre "Golden Age-Ribbed" Tea Service consisting of TEA POT, CHOCOLATE / HOT WATER POT (each with Lids) and a SUGAR BOWL and CREAMER, by Royal Winton, Grimwades. All are in the Ribbed Pattern. Lovely fully Golden Exterior, these Pieces show very little wear. All Pieces sit on small pedestal ringed feet, and have Thumb Rests on Handles. A beautiful Gold Lustre "Golden Age-Ribbed" Tea Service consisting of TEA POT, CHOCOLATE/HOT WATER POT, (each with Lids), and a SUGAR BOWL and CREAMER, by Royal Winton, Grimwades. All are in the Ribbed Pattern. Lovely fully Golden Exterior, these Pieces show very little wear. All Pieces sit on small pedestal ringed feet, and have Thumb Rests on Handles. Very Good Resale Condition unless noted above or below and in pictures.